- It's never dull here! - I recently went on vacation to Puerto Plata, RD and while there I fell in "Love". I am from the USA and I am now separated from my loved one. I have started the process of obtaining a Fiance Visa however this is all new to me. So I decided to start a blog in hopes that others share my experience!!! I have since being home tried to find resources to stay connected to him that did not cost so much. So anyway here it goes my blog???? Any Comments??? - Amber in all colours and all sizes , polished or unpolished. Good prices.Sold Privately. - What's going on over in the United Kingdom. Weekly roundup of news from our British correspondent. - An Amateur Dramatic Society based in Costambar...prepared to perform our productions for your charity, club, group, party etc. 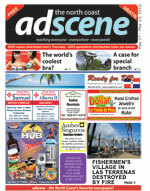 Adscene - What's it all about? - Find out what's happening behind the scene at the North Coasts' only English language print newspaper. - Updates on what's happening in the real-estate section of Dominican Central for realtors. - The dance school which offers classes in Classical Ballet, Tap, Modern, Hip Hop, Salsa & Musical Theatre, has moved to a fantastic new location! - Primarily, I will be focusing on travel related articles and Gostar Direct services in relation to this. - This is just a start blog to test and give ideas. Hope you like it!! - I am thinking about starting a business in sosua and I need feedback. I noticed there are no coin Laundromats, what about a cell phone/internet store. I am looking for something that would appeal to tourist and local residence. - Share your renting and buying experience, tips and advice. Tell us about moving here, importing things etc. If you need to go negative, be careful to share the experience, not the name of the company or person. We just want to learn from each other!